The penultimate day of stage one proved that the Marvellous 12 is building to a thrilling conclusion. Fans have been calling the Marvellous 12 one of the toughest and most spectacular tournaments they’ve witnessed, and day four’s action kept the hype alive. The biggest matchup of the day in Shenzhen didn’t disappoint. When the world number one and two stepped out on to the court the fans hoped for a battle of the titans, and it’s exactly what they got. Ma Long and Fan Zhendong got off to an even start, with the score level at 6-6 in the first game. But Fan made a strong run of points and with Ma missing two forehands in row from the middle of the table the young contender took the first game 11-6. But a little coaching goes a long way and with the help of Qing Zhijian, Ma moved up a gear and took a 9-1 lead in the second game. Yet in perhaps a crucial series of points Fan was able to regain some momentum, only going down 11-5. The pair were point for point in the deciding game until Ma broke ahead 9-7 and then 10-8. It was two match points, and he was to have another at 11-10, but it wasn’t enough. Fan was able to make the important pivot forehand or the big backhand down the line, while Ma was more conservative in the backhand half. Fan Zhendong took the match 14-12 in the third. Ma Long was disappointed with the final result but not his play. It was certainly one the highest level matches Shenzhen had witnessed so far. While only ranked one spot below his opponent, the win was an impressive hurdle to overcome for Fan. 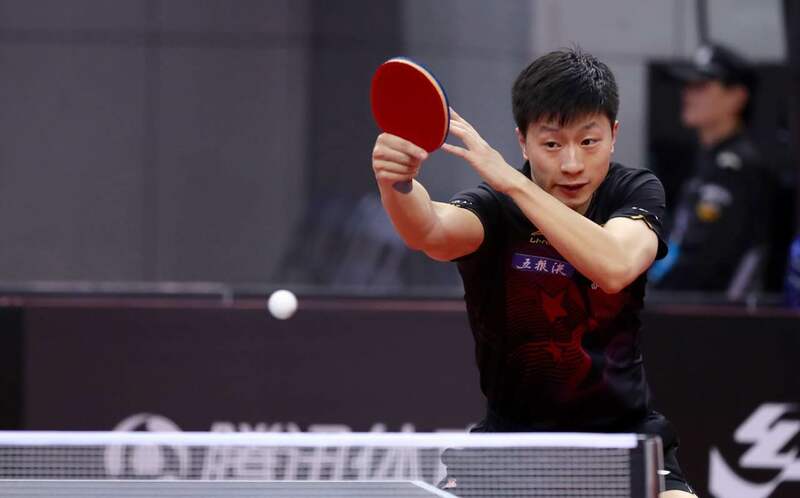 With Zhang Jike out of the picture it is Lin Gaoyan who has stepped up to fill the absent spot in the Big Four. It was yesterday’s 2-1 win against Xu Xin that cemented his place in the top four on the ladder. Surprisingly 2015 World Championships silver medalist Fang Bo is currently bottom of the table with only one win to his name. Will he get the chance to defend his place in the final from two years ago? In the women’s draw the biggest upset of the day came from Mu Zi. With a tough day four ahead of her, up against Ding Ning and Liu Shiwen, Mu was able to finish the evening with one win and one loss, taking down Ding 2-1 and only going down to Liu 1-2. For Ding Ning however the loss was not completely unexpected. With seven wins and only one loss, Ding Ning is still well placed to finish top of the table, and it may just come down to a head to head matchup with Liu Shiwen. But who would bet against Liu Shiwen? So far she has played the perfect tournament; eight wins without a single loss. Day five commences Tuesday 7th March at 13:05 (GMT+8) local time, so be sure to catch the action live on the ITTF Facebook page or on our YouTube channel.